EVM is capable of saving considerable printing stationery and transport of large volumes of electoral material. It is easy to transport, store, and maintain. It completely rules out the chance of invalid votes. Its use results in the reduction of polling time, resulting in fewer problems in electoral preparations, law, and order, candidates' expenditure, etc. and easy and accurate counting without any mischief at the counting center. It is also eco-friendly. EVM consists mainly of two units - (a) Control Unit (CU) and (b) Ballot Unit (BU) with cable for connecting it to Control unit. Both the units consist of one microcontroller (8052) each. The CU consists of one LCD, one hex keypad and a couple of switches, while BU consists of a candidate panel, a vote cast panel, and a buzzer, etc. 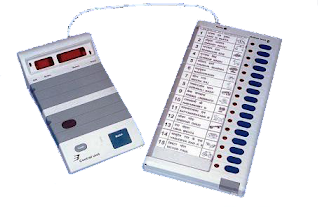 The EVM consists of a control unit (CU) and ballot unit (BU), out of which CU is working independently and in collaboration with a microcontroller. The BU is accepting a vote signal in voting mode and is responding accordingly. In the voting mode, BU communicates with a microcontroller in order to exchange various signals. In case of low ‘vote signal,’ the ballot unit is not at all responding to push to button switch which is an interfacing medium between the voter and the ballot unit. Interfacing between the voter and the and ballot unit is running successfully with the help of vote cast LED panel. The feedback system of the control unit is running successfully with the help of an LED system. In total, the complete system (including all the hardware components and software routines) is working as per the initial specifications and requirements of our project. Because of the creative nature of the design, some features can further be fine-tuned and can become more user-friendly. So certain aspects of the system can be modified as operational experience is gained with it. As the users work with the system, they develop various new ideas for the development and enhancement of the project.